2006 Triple E Embassy Class-A Motorhome. Motorhome has a 3 season deluxe package ie double windows, heated H2O tanks, and foam under coatings so you can comfortably use it in colder weather. It sleepers 6 and has a large bench style dinette that sits 6. There is a full size stand alone shower, new TV, 6 new tires and many extras. It has been well maintained and is in good condition. One owner, no pets, non-smokers. Must sell due to health issues. Please call 403-255-1583 to view. 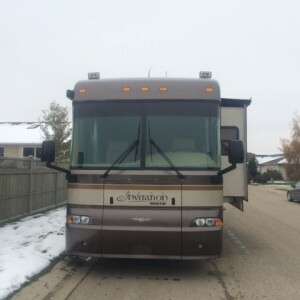 2007 Glendale Titanium 34E39QS Fifthwheel. This beauty is fully loaded, 4 slides, 2 awnings, 3 solar panels, quad carrier(Idaho Tote), ultra slide hitch. One owner, no smokers. Because of unique design over the cab has less wind drag for better mileage and you can stand up fully in the bedroom. Stored undercover, had winter package, air conditioning, central vac, two TVs. One slide is computer desk, kitchen slide, super slide, and full bedroom closet slide etc. Please call 250-919-3137 to view. 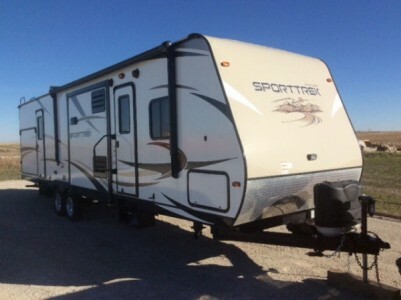 2015 Sport Trek 320VIK Trailer. This trailer has three slide outs one in the kitchen that opens up the island. Living room slide out is extra large. Then a slide out in the kids bunkhouse area. Large TV and DVD sound system built in with exterior speakers. Outside kitchen with hot and cold water. Custom cover included. Queen size bed in master bedroom with pillow top mattress. Electric awning and front jack. Twin 30 lbs LP tanks upgraded. Max air vents on the roof on all vents. Mag wheels. Electric fireplace included also. 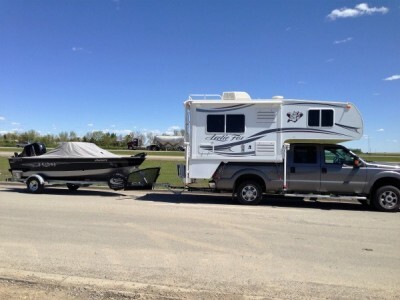 Too much to list please call 403-498-8889 for inquiries this was a $70,000 trailer and comes with extended warranty. Please call 403-498-8889 to view. 2011 Heartland Road Warrior 395RW Fifthwheel. 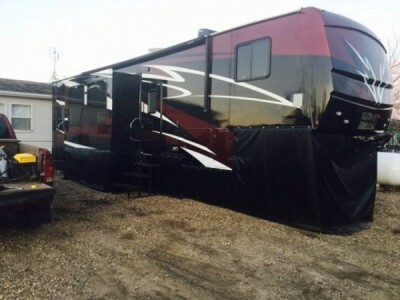 Get ready for fall camping in this self contained 40ft 5th wheel/ toy hauler with a 12ft garage. 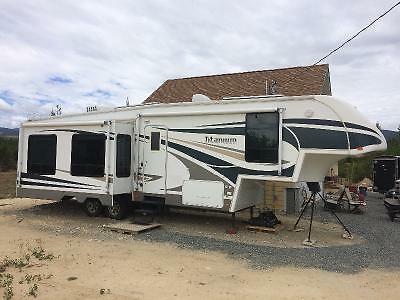 Features are 5500w generator, polar package, fueling station, second washroom off garage, central vac, hook ups for washer/ dryer, 2 queen beds on a lift in the garage, a loft bed and a master bedroom, slam latches on outside compartments, hydraulic slides and legs, 2 maxi vents, an air conditioner, outside water station, lots of storage and the usual items like a TV, fridge stove and microwave. As well it has a transferable extended warranty till Sept 2018. The unit dry weight is 13,500lbs and measures 43ft long. Please call 403-342-2878 for more information. 2007 C & C Living Quarters Stock Combo. 36ft on the floor 14ft living quarters 22ft stock. New items for upgrade on the trailer include new AC unit, new awning, new fridge, 5000w Onan generator (not installed yet). Tires & rims upgraded from 16in to 17.5in with 18 ply tires. Full living quarters with private bathroom, shower, sink & toilet. Stove, microwave & TV. Love this trailer, would not sell it but we are buying a diesel pusher motor home. Please call 306-515-3927. 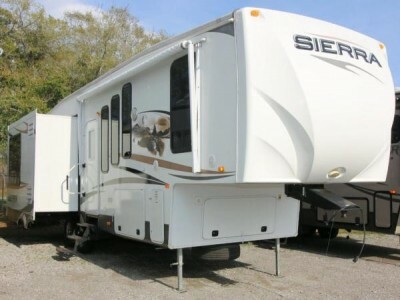 2012 Forest River Sierra 330RL Fifthwheel. 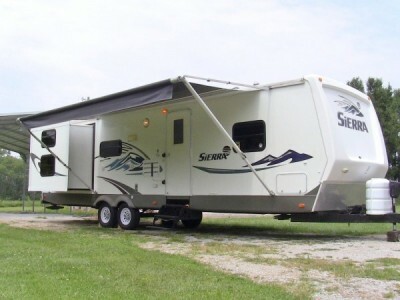 A great fifth wheel design, rooms are open and airy with large panoramic views that shower you in an abundance of natural light. Modern kitchen with residential quality and raised panel cabinet doors. Complete with fireplace, leather recliners, pull out sofa, king sized bedroom, sliding closet doors,washer/dryer hookups, A/C, bathroom with a shower, built-in vacuum and much more. Has never been been towed on highway, been parked in the same spot for 4 yrs. only been used about 15-20 nights, excellent condition. Currently parked at Keho Lake. Please call 403-894-1671 to view. 2006 Corsair Excella 34Ft + Lake Lot combo. 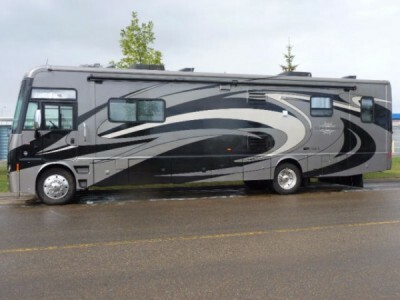 This fifth wheel is a beautiful Canadian built Corsair Excella Polar Pak Model 34RLTS Triple slide. Rear Living Room, Upgraded Queen Mattress, Power Awning, 100-watt Solar Panel, 1500-watt Pure Sine Wave Inverter, Insulated Snap on Skirting for year round living, RV Cover for winter storage, Tires replaced in 2010. Willing to sell RV separately. 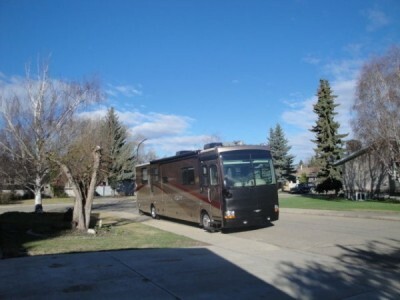 Snowbirds this beautiful RV is ready for you to hook up to and get to warmer weather! Please inquire. 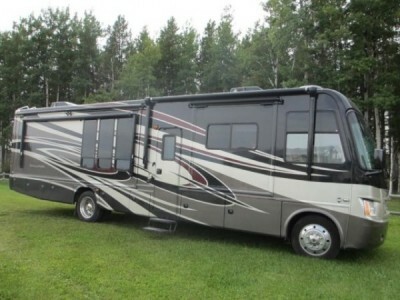 This well maintained RV sits on a large rented lot at Spruce Point Park on Lesser Slave Lake. The lot is Serviced with Power and Sewer. Included on the lot is a 10 x 20 covered shed, outdoor kitchen and dining area, 8 x 20 deck, wood stove, wood shed, garden shed, water storage tanks, propane bbq and many more extras. What a beautiful location! It’s a five-minute walk to the Lake with a White Sandy Beach, Boat Dock, Marina and Mini Golf. The lake has Great Walleye Fishing and is perfect for Water Sports. For more information, please phone 780-712-1727. 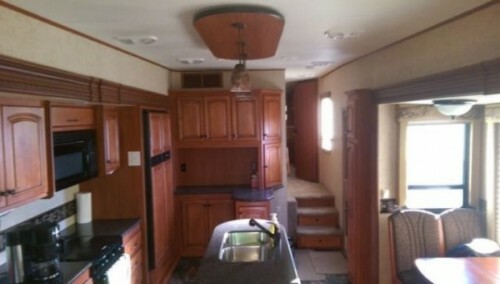 2013 Open Range Journeyer 340FLR Fifthwheel. 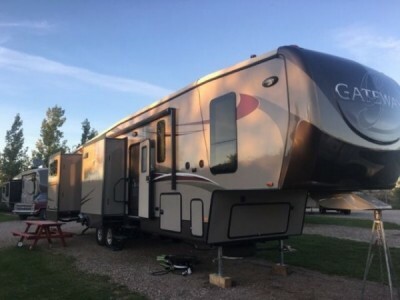 If you are looking for a travel trailer but would like the layout, storage of a fifth wheel and you can haul a quad in the back of the truck, then this is the trailer for you. 34 ft long with 3 slide outs. Up front living with steps up to the bathroom and bedroom like a fifth wheel creating a full pass through storage. 4 20lbs propane bottles, 2 flat screen TVs, power awning with LED lighting, and much more. I have done some upgrades that will go with the trailer. Custom skirting for the bottom of the trailer and to wrap around the slides. I've stayed in the trailer in mid November and toasty warm. Power self finding explore Shaw Sat dish. One push of the button. So nice. Also I will let the 2 HD receivers go with it. One is a HDPVR. Washer / Dryer combo. Very nice. No more going to a laundry mat. Solar panel on the roof. Batteries always fully charged if camping in the bush. All black Maxx air vent covers. Exterior paint protection. Please call 780-235-2553 to view. 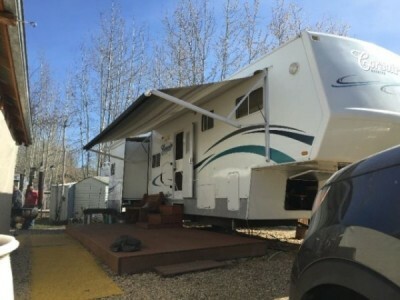 2007 Forest River Sandpiper Fifthwheel. New tires. New microwave. New batteries. Excellent condition. Upgraded Queen mattress. Winterized. Please call 778-222-6415 for more info. 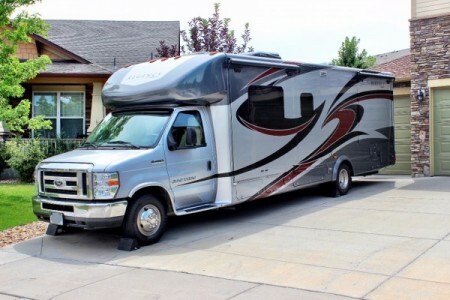 2009 Winnebago Era Limited Class-B Motorhome. 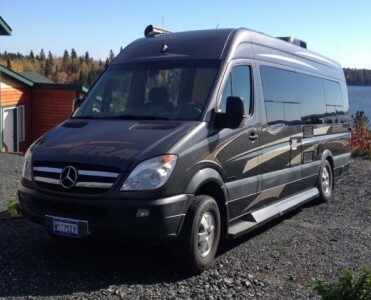 Dodge / Merecedes-Benz Sprinter chassis, 24 feet long, 3.0L 6-Cyl turbo diesel engine 154 HP, Great mileage. Main features include:- 2 forward captains chairs swivel for moveable dining table, 2 rear captains chairs, removeable to insert extra storage drawers & closet, Jensen sound system, TV-CD/DVD player with cable connection and antenna, Gas stove with 2 burners, Stainless steel sink, Refrigerator with freezer, Microwave, Water heater, 6 gal - gas/electric with electrical ignition, Furnace - 16,000 btu, Roof top AC., low profile, Bathroom has toilet/sink/shower, Electric rear sofa/bed ( king-size), Outside awning, 3500 onan electric generator, Serius satellite radio ready, Window blinds for all windows, Tinted side windows, Carbon monoxide & smoke detectors, Rear class 5 hitch, Custom-fit storage tarp. NOTE: All maintenance has been done at authorized Mercedes Benz dealerships with full reports available. The unit was purchased in the USA then brought to Canada, inspected & certified. We are the second owners and have just completed a 15 month tour so we can attest that everything runs smoothly! Please call 587-830-5800 for more info. 2012 Heartland Big Country 3650RL Fifthwheel. Three slides. King bed. Full size shower. Washer dryer prep. Fire place. Three slides.16 ply tires . Built in vacuum.pass through storage . 100 gallons fresh water . Detachable power cord . Remote control jacks , awning , slides. Hydraulic landing gear and slides. Clean clean clean . As new Always stored inside during winter. Going south ? This unit is as new and is in storage winterized and ready to go. Save big dollars on the cost of the US exchange happening to the new units. Please call 403-634-4413 to view. 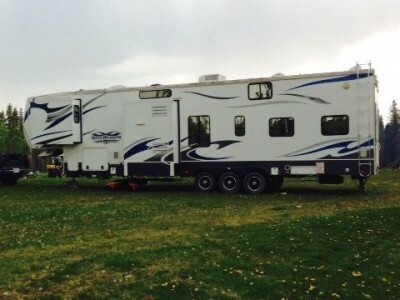 2011 Gulfstream Enduramax 3912 Toy Hauler. Sleeps-10, Slides-3, Length-40ft 10in, Ext Width-8ft 6in, Ext Height-13ft, Gross Weight-18000 lbs, Dry Weight-12450 lbs, Fresh Water Capacity-112 gals, Grey Water Capacity-99 gals, Black Water Capacity-54 gals, Furnace BTU-35000 btu, Generator-Onan 5500, $12000 custom paint job. Excellent Condition. Please call 780-608-0880 for more info. 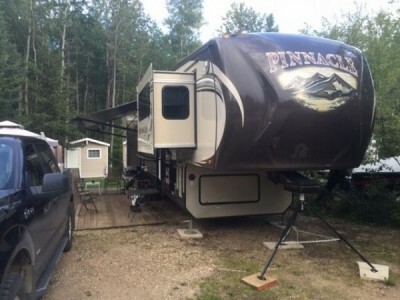 2014 Jayco Pinnacle 38FLFS Fifthwheel. Excellent condition. Living room up front in this unit, great floor plan, 5 slides - 2 up top in the living room, 1 - is the table going out the opposite side, this way you have the full use of your awning and 2 slides in the back bedroom with king size bed. Remote control for the slides, awning and lights, Large Norcold refrigerator, 12 gallon hot water tank, climate package, 2 air conditioners, fantastic fan, lots of storage, large shower, 60 inch TV and fireplace in front living room, TV in bedroom and TV outside in compartment under awning, satellite dish and stand with two receivers, pin tripod, auto leveling, outside shower, MorRyde. This is a great unit, only selling because I purchase a lake lot. Jayco has so many great features in these units, you wont be disappointed. Please call 780-975-3613 for more info. 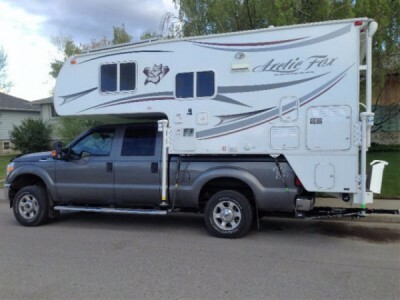 2014 Arctic Fox 811 Camper + 2014 Ford SD F-350 4X4 Crewcab 156"WB 6.2L EFI V8 GAS ENG. Truck + Lund 1650 Rebel XL 16'9" Sport Boat Combo package. Loaded with lots of extras! Fully winterized and stored for winter in Calgary. New Snow tires on truck this month. Full service package transferable. Available for viewing by appointment. Buy the complete package before the end of February as listed and receive the two Islander fishing rods pictured and the storage shed with the boat pix valued @ just over $2500.00 CDn$. Please call 587-432-3023. 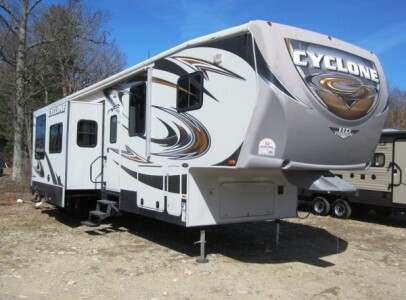 2012 Heartland Cyclone 3800HD Toy Hauler. Selling my toy hauler as I moved to the lake. I no longer require it. Comes with professional skirting 5000 option. Please call 403-916-4338 for more info. 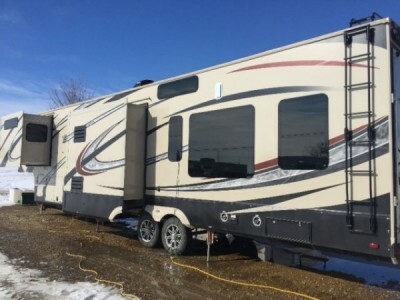 2015 Heartland Gateway 3650BHS Fifthwheel. Beautiful bunk model fifth wheel. Fully loaded with King bed in master. Washer dryer prepped. Full size stainless fridge. Huge kitchen with U dinette. Huge bunk room with 2 bunks and a pull out couch. 2nd half bathroom in the bunk room. Power awning with LED lighting. 2 ACs. Outdoor kitchen with RVQ. Total length is 41ft. Trailer is hardly used and is in mint condition. Please call 403-952-1795 for more info. 2014 Artic Fox 811 Camper + Ford SDF-350XLT 4X4 CREWCAB6.2LEFI V8 GAS ENG. Truck/AUTO TRANS. Combo. Loaded with lots of extras! Fully winterized and stored for winter in Calgary. New Snow tires on truck this month. Full service package transferable. Available for viewing by appointment. Please call 587-432-3023 to view. Slide out topper awnings. 22.5in Tires. Auto leveling jacks with touch pad controls. 3 slides. Back-up camera and 2 side view cameras. Custom fit leather captain chairs-Power Driver Seat. 2 brand new 6-volt batteries in a series. Tow package with brake module. Ford Chassis- 6.8 L Triton V-10 Engine. Dual Air Conditioners. Fireplace. Dishwasher. Convection Microwave Oven. Double Pull out couch. Solid surface countertops. 3 TVs. Front electric privacy shade/sun visor. Sliding French Doors making Livingroom/ 2nd Bedroom separate. 3 Years Extended Transferable Warranty. Please Text or Call Roger @780-621-2063. Sorry no Trades or Paypal. 2006 Damon Tuscany 3974 Class-A Motorhome. 40ft long, 3 slides, CAT engine, 7500 diesel gen with 600 hrs, the list is long also a may consider trades on recreational property but nothing else. Please call 403-793-4205 for more info. 2014 Grand Design Momentum Toy Hauler 385TH. Beautiful 5th wheel. Has all the bells and whistles. Electric fireplace, huge pantry, 1.5 bathrooms. King size bed, loft bed in gallery, 2 queen drop down beds in garage (garage is 12ft). Tons of storage, large shower, fantastic fans, 2 a/c units. Trailer also comes with Wineguard self finding satellite dish and full winter skirting. 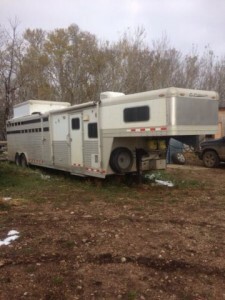 These 2 features alone are worth $10000.00 its a great fifth wheel in great condition. Can take and send more pictures. Please call 403-506-0064 for more information. 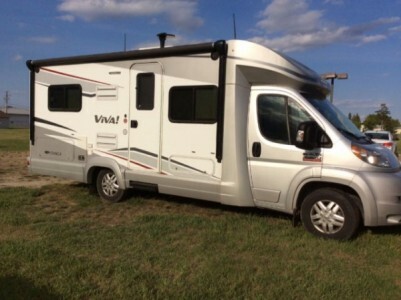 2015 Winnebago Itasca Viva 23L Class-B Motorhome. 24ft. Long. 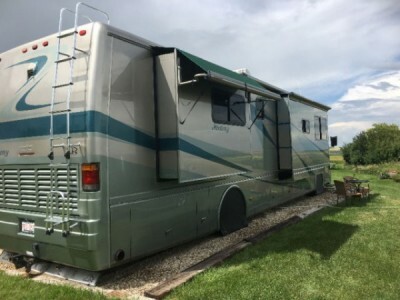 Sleeps 6, Adjustable Table, Swivel Front Seats, Roof Sky Light, 3Burner Propane Stove, Fridge 2-Way, Onan Generator, Furnace, Water Heater (Tankless), 2 Flat Screen TVs, Microwave, Air Conditioner/Heater, Backup Camera, Electric Awning With LED Lights, Electric Steps, L.P. Tank, Monitor Panel, Outside Shower, Holding Tanks Heated, Exterior Speakers, TV Antenna Digital, Cable TV And Satellite Connections, Roller Shades, Galley Sink, Vinyl Flooring, DVD Player/Radio/Deluxe Sound System, Ram 3500 Promaster Chassis With 3.6 L Engine /Automatic Transmission, Electronic Vehicle Information Center, Navigation System, Bluetooth Hands Free Calling, Voice Command, Spare Tire, Battery Boost Switch, 3/60 Basic Warranty 5/100 Powertrain. Please call 780-673-3250 for more info. 2008 Triple E Regency GT27S Class-A Motorhome. 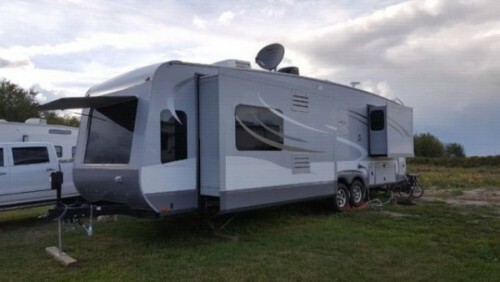 Day/night shades, 2 fantastic fans, 2 TVs, Generator, upgraded Queen bed, Microwave, Stove, Roof Air-conditioner. Please call 780-987-2722 to view. 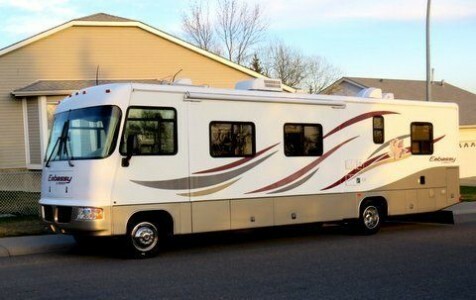 2006 Fleetwood Discovery 39J Class-A Motorhome. This is beautiful used motorhome. Well looked after. (like new) 39 feet in length. 330 HP CAT engine with largest Alison transmission. Jake break. 7000 watt generator. 3 spacious pop outs.Heated basement and foamed undercarriage Leather interior. Washer and dryer. Large living quarters. Beautiful counter tops. Large bathroom and shower and are separated. Hide-a-bed in the couch and the table make into a bed. Car towing device comes with the unit. Very motivated to sell due to illness. WILL NOT SHIP! Please call 403-350-5372 to view. 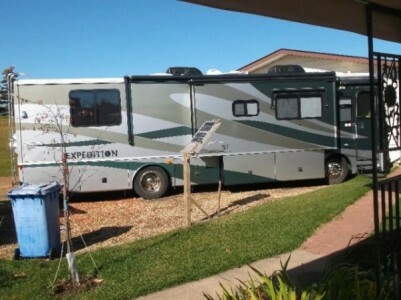 2005 Fleetwood Expedition 34R Class-A Motorhome. $30000.00 in recent upgrades Flat screen TV and upgraded entertainment system, extendable table & chairs new cabinetry, Washer dryer combo, Upgraded night/day window shades, new plank flooring, Non smoker no pets. This unit is in exceptionally clean and in great condition. Full exterior body paint. Cat 300 HP diesel pusher, Good tires. Far too many options to mention you need to look to see the value. Ready to head south this winter. Please call 780-608-0796 for more info. 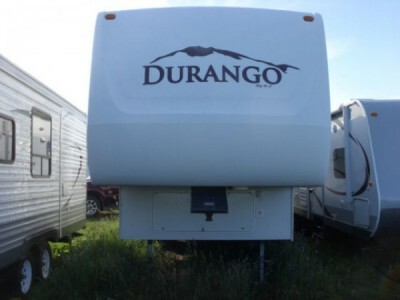 2007 K-Z Durango 305RE Fifthwheel. Excellent condition, two slides. high mount celling everything goes with unit. Please call 780-333-6144 for more info. 2012 Itasca Suncruiser Series M37F Class-A Motorhome. Ford F53 24,000-lb. Chassis 362-hp 6.8L V10 SEFI Triton engine, Bath & a half with oversized shower, 36x36in, King Sleep Number Bed, Washer & Dryer, Three Slides with awnings, Four Door Fridge W/Icemaker, Convection/ Microwave Oven, Upgraded Cabinetry, Corian Countertops with Flip Up Extension, Upgraded Leather Sofa/Sleeper, Recliner, Driver, Passenger Seats, Satellite System with Auto Seek, Three TV's, Exterior Entertainment Center, 5.5 KW Generator with Auto Start System, Hydraulic Levelling System [Automatic], 3M Flim, Steering Stabilizer, Drivers Door, Rear & Side Vision Cameras/ Monitor, Many Extras, This unit is like new, ready to roll. Please call 780-983-1070 for more info. 2005 Beaver Monterey 40Ft Class-A Motorhome. New seats, covers, carpets, floors. Please call 406-544-9455 for more info. 2004 Newmar Essex 4503 Class-A Motorhome. Natural Cherry Hardwood with Sliver Hardware, 500 HP ISX Cummins on Spartan Chassis, Michelin Tires, Allison 6 speed, 12.5 Onan genset, all new batteries, RO system with 5 gal tank, Outside TV and BlueTooth CD Player, Inside TVs are upgraded to LCDs, Washer and Dryer, Norcold Freezer Pullout Tray, King Bed, LED lights, TPS System, Blue OX Tow Bar. Please call 780-837-4462 or text for more information. 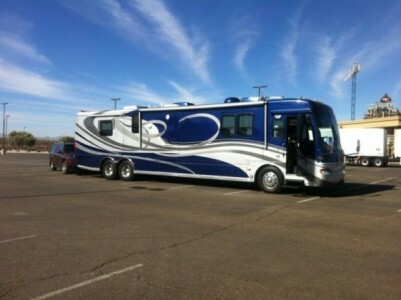 2008 Triple E Invitation 39Ft Class-A Motorhome. 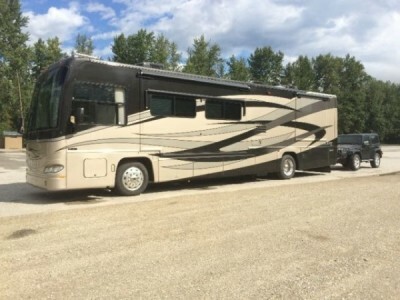 Selling 39' diesel pusher motorhome. 330HP Mercedes Benz Allison Automatic. Quad slides. Auto levelling system. Solar panel, inverter 5500 Watt generator, dual roof top Duo Therm A/C, Stormtec windows. 4 Door fridge with ice maker, convection/microwave oven, washer dryer combo. Solid maple cabinetry,tile and carpet flooring, corian countertops. Home theater, 2 TVs in living area and one in bedroom. Auto satellite system. Unit is built for Canadian winters. Lots of storage inside and out. Many more options not mentioned. Unit is in excellent shape. Please call 403-391-0853 to view. 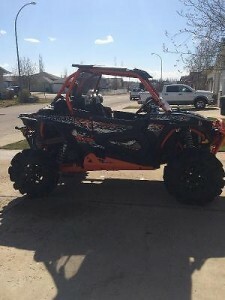 2015 Polaris XP1000 Highlifter. 1000cc engine. Well maintained unit in very good shape. Includes approx. $1000.00 in extra. New parts. Please call 403-391-0853 to view.